Wadi Run Desert, also known as ‘The Valley of the Moon’, is the place where Prince Faisal Bin Hussein and T.E. Lawrence based their headquarters during the Arab Revolt against the Ottomans in World War I, their exploits intrinsically woven into the history of this amazing area. 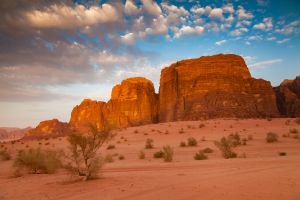 Wadi Rum is a stupendous, timeless place, virtually untouched by humanity and its forces. Here, it is the sun and winds that have carved the imposing, towering skyscrapers, so elegantly described by T.E. Lawrence as “vast, echoing and God-like..." A maze of monolithic rockscapes rise up from the desert floor to heights of 5,700 feet, offering the tranquility of the boundless empty spaces, pierced by canyons and water holes as well as 4000-year-old rock drawings and other spectacular treasures this vast wilderness holds in store: the Burdah Rock Bridge, the Seven Pillars of Wisdom. 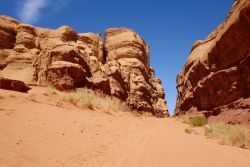 The area is inhabited by the indigenous Bedouin people who still maintain their semi-nomadic lifestyle. Known for their hospitality, they are friendly and often invite visitors to sit and enjoy a coffee or even a meal with them.